Round Four of the 2018/2019 Cranecorp WA Modified Sedans Series will be held in this Saturday Night at the Trade Hire Augusta Margaret River Speedway in the South West of the State. A healthy field has entered for the fourth round supported by Blackman Fabrications, with the series set to embark on a busy time with the remaining four rounds to be held over the next two months. Nathan Penn has won two of the opening three rounds of the series with the Ford Falcon driver enjoying a healthy points lead heading into this weekends event. 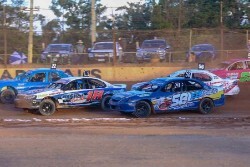 2019 South Coast Classic winner Branden Fraser narrowly defeated Penn at the high paying event held at Albany early in the new year, with the two also having a great dual at the last round of the WA Modified Sedan Series held in Collie just prior to Christmas. Former State Champion Allan Mortimer will be in action after returning from racing in the Kings Royal event in Queensland and has shown solid form this season. Jayden McCuish, Paul Stevens and Matt Noakes have all enjoyed podium results already this season and should be prominent this Saturday.